On Bilking The Sophisticated, Or, Check It Out: We're Suing Banks! I took a break to enjoy the holiday, as I’m sure many of you did, but my inbox kept busy, and on Friday came a doozy, courtesy of the Washington Post. You remember that little bit of a banking crisis we had a couple of years back, where banks around the world might have possibly, maybe, just a little, conspired in a giant scheme to package toxic mortgage loans into Grade A, investment-ready securities instruments, which then blew up in everyone’s faces to the tune of a whole lot of taxpayer bailouts? Well all of a sudden, it looks like an agency of the Federal Government is looking to do something about it, in a real big way. 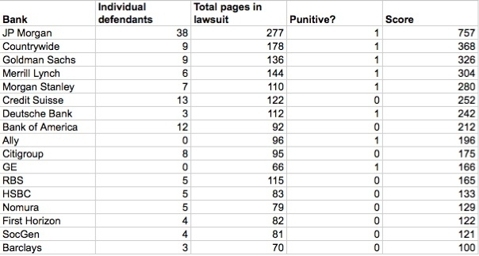 Last Friday the Federal Housing Finance Agency (FHFA) announced they’re suing 17 firms (I’ll give you a list, bit it’s pretty much all the usual suspects); depending on who you ask the Feds are seeking an amount as high as $200 billion. As Joe Biden would say, it’s a big…well, it’s a big deal, anyway, and that’s why we’re starting the new week with this one. As we said, on Friday the Washington Post and others reported that there were a series of lawsuits filed by the FHFA in their capacity as Conservator of the assets of Fannie Mae and Freddy Mac against darn near everyone. The FHFA is alleging, to make a long story short, that everyone involved misled Fannie Mae or Freddy Mac (the “Entities”, in the words of the lawsuits), to some extent, and that the misleading involved making representations to the Entities about the various metrics related to what Fanny and Freddy were buying from these banks. For example, it’s alleged that when certain banks sold batches of mortgage loans to the Entities, they lied about how many of the owners were actually living in the homes; that makes a difference when you’re trying to figure out how likely a borrower is to pay back a loan. It appears that a defense the banks will offer is that Fannie and Freddy were “sophisticated investors” who should have known the risks buried in the batches of loans they were buying (and they were sophisticated investors: they bought, literally, trillions of dollars worth of loans) – but if it can be proven that the banks were lying about what was in the loan packages, that defense might not do so well in front of a jury. “Everyone involved” includes Bank of America (B of A), Citigroup, JP Morgan Chase, Countrywide (which means B of A is actually being sued twice), Deutsche Bank, Credit Suisse, the UK’s HSBC and Barclays Banks, France’s Société Générale, the Royal Bank of Scotland, Nomura Securities (representing Japan), and GE and GM (GE Capital is a surprisingly large and varied business; GM got in the banking business to finance auto sales, and you may today know them as Ally Bank). Of course, Wall Street is also part of “everyone”; that’s why the list also includes Goldman Sachs, Morgan Stanley, and Merrill Lynch (which means, thanks to acquisitions, that B of A is actually getting sued three times). The City of Memphis also proudly makes the list, thanks to First Horizon. Some notable names not on the list? Key Bank and Wells Fargo, who seem to have escaped action so far; there’s also UBS (Union Bank of Switzerland), who was already served with a similar lawsuit in July. It has been suggested that the FHFA is in an inherently conflicted position in all these cases. That’s because the agency is acting as both the regulator of these banks and the “victim” as we seek any monies that may be due from any fraud. So what would be a better situation? Should the FHFA continue to regulate the banks they’re suing as a victim, or should another regulator be put in place…or should another Conservator be appointed, leaving the FHFA as “just a regulator”, and not a victim? It’s a question worth about $200 billion, more or less – and even in these times, that’s still a lot of your money.